Outlaws ‘Till The End, Vol 1. This album is an amazing concept and something I kind of want more of. Judging by the title, we might just get it. 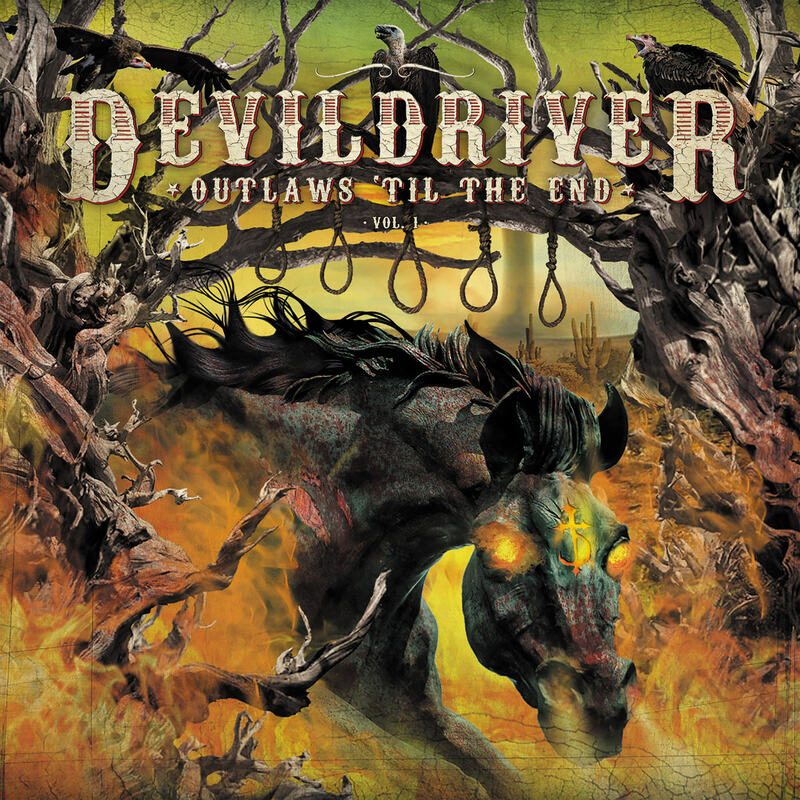 DevilDriver, have created an album full of metal covers of classic outlaw country songs. Outlaws ‘Till The End Vol. 1. I’m a huge fan of country and metal music, so this works perfectly for me. Also, this doesn’t feel like a cheap cash-grab. There does seem to be a real effort and passion put into the album. It’s clear from listening to it that DevilDriver has a lot of respect and love for the artists that they’re covering. All of the songs pack a punch straight to the gut and give new life to these songs for a new generation, who may have never encountered them otherwise. Covering artists like Johnny Cash, Willie Nelson and The Eagles. They manage to capture the soul of the original songs whilst, at the same time, putting their own mark on the tunes. Giving every song that signature DevilDriver edge that sounds really brutal. Production-wise, the album sounds great. With chugging guitars, well-executed drum work and Dez Fafara screaming his heart out. Producer, Steve Evetts, did a great job putting this project together. Every instrument sounds brilliant and Fafara roars over the top of it all, creating an energetic and fierce sound. Joining DevilDriver on the project is an all-star cast of metal artists: Wednesday 13, Lamb of God’s Randy Blythe and Mark Morton, Lee Ving from FEAR, Glenn Danzig, Brock Lindow of 36 Crazyfists, Testament’s Chuck Billy, and John 5. Who all add that little bit of flavour to an already delicious sound. As well as the metal star power, there’s a cool appearance from country heavyweight, Hank Williams III. Who performs his song “Country Heroes” with DevilDriver. The songs are already tried, tested and beloved outlaw country songs like “Ghost Riders in the Sky” by Johnny Cash, “Outlaw Man” by The Eagles and “A Thousand Miles From Nowhere” by Dwight Yoakam. So as far as the songwriting is concerned, it’s great. It really is the way DevilDriver have re-imagined these songs and made something truly original out of them. Almost turning them into their own songs. The way they take the familiar elements and put their own spin on things is mesmerising and is still enjoyable on the other side. No doubt this album might be little divisive to some. Fans who might have just wanted more original content from the band may be annoyed by a cover album. Also, country fans may not like the idea of these metal versions, “destroying the original sound”. Yet, I really like the idea here. More importantly, I like the execution and delivery. DevilDriver has made a fun, compelling record that I think people will really enjoy. The existence of the covers doesn’t ruin the originals but continues their legacy by getting new listeners on board. Be that with songs they’ve never heard, in the case of metal fans. Or a genre they’ve never considered, in the case of country fans. Since the title is “Volume 1” all I can say is when is “Volume 2” coming? This entry was posted on 18th July 2018 at 8:24 pm and is filed under CD, Metal with tags DevilDriver, Groove metal, Melodic death metal, Mick Birchall, Napalm Record, outlaw country, Outlaws. You can follow any responses to this entry through the RSS 2.0 feed. You can leave a response, or trackback from your own site.